Danny Lipford with inexpensive interior upgrades. When the summer heat makes it too hot to tackle outside projects around your home, keep your cool by turning your attention indoors. From adding a decorative ceiling and replacing a worn floor to installing a new kitchen faucet and upgrading a noisy range hood, here are four great interior upgrades that can improve the look and function of your home. Add a touch of elegance to any room in your house by installing decorative Metallaire Bead ceiling panels from Armstrong. The 24” x 48” panels are available a range of finishes including copper, brass, lacquered steel, and classic white. Decorative border and cornice material is also available. Another popular DIY project that can really change the look of your home is replacing worn carpet or vinyl with hardwood flooring. Armstrong engineered wood flooring from the American Scrape™ Hardwood collection is made from American hickory, which is known for its beauty and durability. The 5” wide planks are available in a range of colors and have the authentic look of a vintage hand-scraped floor. The flooring comes finished with Armstrong’s lifetime finish, which provides both scratch and stain resistance. Kitchen faucets have come a long way in recent years, and replacing a dated or worn out faucet with a new model, such as the Opulence™ single handle pull-down kitchen faucet from Danze, makes a great DIY project for your home. The Danze Opulence faucet is available in five different finishes, including chrome, stainless steel, antique copper, and tumbled bronze. 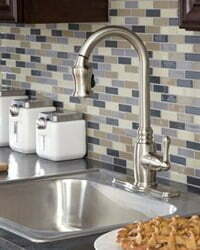 With its tall swivel spout and dual function pull-down spray, the Opulence faucet is both practical and fashionable. A ceramic disc valve on the faucet provides a tight seal for drip free performance and long life, while the pull-down hose incorporates a spring retraction system for ease of use. The single hole mount has an optional deck plate for installation on traditional three hole sinks. Kitchen islands equipped with a built-in cooktop are more popular than ever, since they are conveniently located to make cooking the focus of activity. 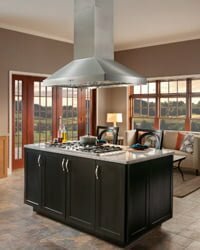 Installing a Broan freestanding, chimney type range hood over an island cooktop is important to remove unwanted moisture, heat, and odors from the kitchen and improve indoor air quality. Broan range hoods also provide much needed lighting over an island and are available in a wide range of styles to fit any kitchen. The multi-speed fans on Broan range hood fans are both quiet and efficient, and the Heat Sentry™ feature detects excessive heat and adjusts the blower to high speed automatically when needed. The chimney on Broan range hood has a telescopic flue to make it easy to install with various height ceilings. 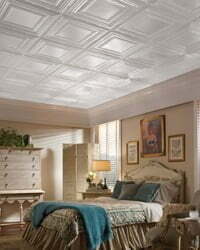 Watch Inexpensive Interior Enhancements for Your Home to find out more. What is an inexpensive way to install a microwave? What was the tip you gave for inserting a tube on the hand soap dispenser to make it easier to refill?